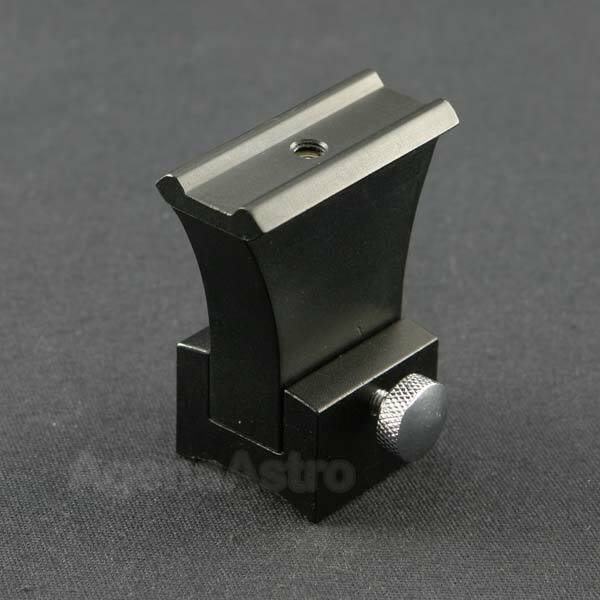 Agena Type B0 Mounting Bracket and M5 Base for Agena Multi Reticle Reflex Finder. This Type B0 bracket/base is a spare two-part mounting system for the Agena Multiple Reticle Finder (MRF). The base can be attached to any telescope that has an M5 screw hole for attaching finder brackets. Examples of this are all William Optics telescopes and many Astro-Tech telescopes and clones. This item is included with the Agena MRF (with Type B0 mounting bracket version) as a standard item, but we also sell this additional stalk and base separately so that you can use the same finder on more than one telescope. Also, if you have the Agena MRF (with B1 Synta-style base), then you can remove the B1 base and replace it with this item should the need arise to change the bracket/base type for a different telescope. This base is CNC-machined from solid aluminum and is anodized matte black. The included locking knob is chrome-plated. The underside of the mounting shoe is felt-lined to keep from scratching the finish of the telescope on which it’s mounted. This also adds friction and prevents the mount from rotating on the focuser or telescope tube. The mounting bracket is 13.5mm wide. Agena supplies a quick release shoe and two M5 mounting screws with this item. You may also be able to use this mount on a catadioptric telescope by replacing the included M5 mounting screws with others compatible with your SCT. Note that when mounting the bracket shoe on a catadioptric telescope (SCT), there may be a slight gap between the shoe’s underside and the scope due to the larger diameter of most SCTs relative to a refractor. Not sure what the base was supposed to fit, but I was able to get it on my scope with only one screw. Seems tight enough and the body then sits in that base in a somewhat random manner. Time will tell if it is consistent. Lost my little bracket at a Dark Site Outing - couldn't mount Reticle Finder. Management directed me to the bracket only purcchase. Friendly and courteous. This is a high quality base that allowed me to use a multirecticle finder that had a Synta/Orion base and attach it with the enclosed screw (included two and has three holes, but telescope has one hole) to my AT72ED. Review by sarcosuchus imperator of Bryan OH. This is the base for mounting a reflex finder on a GSO or similar focuser.